Dandavats | How Could Sri Rama Do That To His Pregnant Wife? How many devotees will answer the question of how Mother Sita was banished by Sri Rama to Valmiki’s hermitage? “Rama was righteous… He set an example for all…?” Or is there a deeper reason? Such an answer can take the ‘controversy’ out of it. We do not have a right to question any of the Lord’s decisions, but in light of today’s awareness of human rights and the importance of family unity in strengthening spiritual communities, our answer might echo what appears to be a heartless decision to banish a pregnant wife, based on a seemingly major reaction to minor piece of public opinion. Most people will answer that Rama, as an exemplary king, was being righteous in protecting His illustrious royal lineage and remaining aloof from any possible hint of negative public opinion. If we agree with this – and we do, on a social level – then we also agree with something that does not sound right by today’s standards of human decency. SB 9.11.8: Sukadeva Gosvami continued: Once while Lord Ramacandra was walking at night incognito, hiding Himself by a disguise to find out the people’s opinion of Himself, He heard a man speaking unfavorably about His wife, Sitadevi. SB 9.11.9: [Speaking to his unchaste wife, the man said] You go to another man’s house, and therefore you are unchaste and polluted. I shall not maintain you any more. A henpecked husband like Lord Rama may accept a wife like Sita, who went to another man’s house, but I am not henpecked like Him, and therefore I shall not accept you again. SB 9.11.10: Sukadeva Gosvami said: Men with a poor fund of knowledge and a heinous character speak nonsensically. Fearing such rascals, Lord Ramacandra abandoned His wife, Sitadevi, although she was pregnant. Thus Sitadevi went to the asrama of Valmiki Muni. Such high drama certainly evokes human emotions because the Lord plays like a human. While we humans can learn about how Sri Rama dispensed with justice, mercy and compassion, He still has internal and external reasons for performing what He does, recorded and recited over millennia. We can also ask why Srila Sukadeva Goswami mentioned this incident. Surely, he knew this would heighten sensitivities in people on a social level. Then, being an enlightened pure soul possessed of heightened perception and awareness, he would have cited this pastime to evoke higher and deeper emotions that will feature in the next portion of his reciting of Srimad Bhagavatam – the tenth canto. 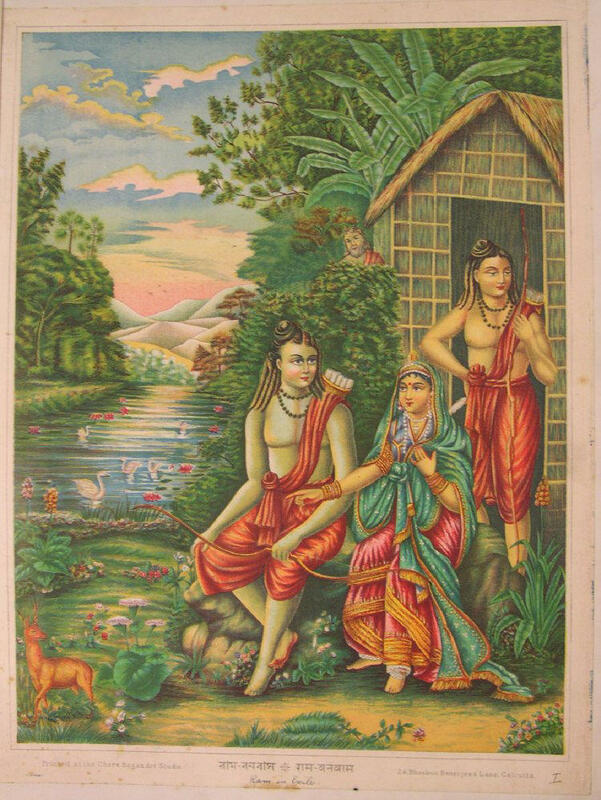 SB 9.11.15: Being forsaken by her husband, Sītādevī entrusted her two sons to the care of Vālmīki Muni. Then, meditating upon the lotus feet of Lord Rāmacandra, she entered into the earth. SB 9.11.16: After hearing the news of mother Sītā’s entering the earth, the Supreme Personality of Godhead was certainly aggrieved. Although He is the Supreme Personality of Godhead, upon remembering the exalted qualities of mother Sītā, He could not check His grief in transcendental love. The banishment of pregnant Mother Sita and Lord Chaitanya’s taking to the renounced order to deprive Visnupriya of a husband, are both socially harsh realities, but they are external ways of enjoying internal spiritual bliss. The Lord reverses the grieving roles in order to experience deeper spiritual emotions. Lord Rama again had His Lord Krishna role in ever-present mind when He granted the wishes of the sages of Dandakaranya, who desired to have Rama as their husband. Those sages were to take birth as gopis in Sri Vrndavana dhama, and experience separation from Krishna, as recorded in the tenth canto of Srimad Bhagavatam. How the Lord wishes to enjoy His on-going pastimes here on earth sometimes confounds our sense of humanity – and how we think the Lord should behave. As some people say, “The whole world is a stage!” How true this is for the Lord. The Lord is waiting for us to join Him on this stage, through nothing other than loving selfless devotion unto Him. When we consider the internal “logic” of Sri Krishna’s pastimes, two considerations are readily available. First, Krishna comes to His Mahatattva to save the pious and to vanquish the miscreants. Well, Sitadevi is, of course, no miscreant! The other consideration is that Krishna is the destroyer of the Mahatattva (not merely its Creator)…kalosmi lokashaya krt. By His nature of destroying the material manifestation, He is teaching us that this material manifestation is both temporary and is not our Home. Lord Chaitanya’s wife died from a snakebite. Lord Chaitanya’s reaction is noteworthy, both for His absence of material lamentation and His philosophical approach to the issue of death and loss. Lord Ramachandra’s lila must have similar deep rationale. We may never be able to understand the extraordinary infinite intellect of the Supreme Lord, but if we want to try to grasp something of the nature of His personality in this regard, we can perhaps see the consistency with which He acts. He is an ocean of mercy! In the spiritual world, where death does not exist, and loving ecstasy abounds, there is no mundane lamentation. Even loss (absence) is stimulus for deeper love and ecstasy. Absence makes the heart grow fonder, especially when considering that Krishna is the Reservoir of Pleasure, and the love of everyone’s life. Otherwise, we can simply hear of the pastimes of the Lord with His devotees and plenary expansions, and allow the knot within our hearts to be cut! As usual, we read a very nice comment by Pusta Krishna Prabhu. Here is something else we can think about on why the Lord behaves as He does. Sukadeva Goswami said that Sri Rama banished Mother Sita for fear that people of “heinous” character might apportion blame on to Him as a ‘bad’ example (Being “henpecked” and so on). We all know that “example is better than precept.” If the Lord’s example of banishing Mother Sita sends a louder ‘exemplary’ message for common men to follow, then why did He do this? Does it set an example for husbands to do the same as He? Again, we are confronted with what we think is the ideal for ‘Rama-rajya’ in a traditional sense, as opposed to one being the protective husband we all expect. It is another twist on why the Lord does what He does, confounding our own ideals and expectations of human values. The obvious outcome of this is, we, none of us, can imitate such behaviour of the Lord who experiences internal bliss. But I can imagine, since it is Kali-yuga, that such behaviour is tempting to imitate, in the name of Lord Rama. I think if we look at this properly we can see that Lord Rama’s example is consistent with universal values that are as applicable today as any other time. Lets set the background. Two constructs are involved. The first is, ;in ancient times the idea was that the King showed the highest level of virtue which was supposed to be followed by all. The second point is; at all times, in spite of variations, in virtually every society a man is duty bound to accept his wife until death( unless he has satisfied certain conditions allowing him to take sanyasa). Now, according the the Ramayana in Bhaktivedanta vedabase the man criticizing Lord Rama had a wife who( it appears willfully)resided for some time with another man. The man essentially told he wife that although Rama took Sita back, it did not mean she could sleep around town and expect him to continue to be responsible for his duty as a husband. Does the sacred vow of marriage today or at any other time mean a man is obligated to a wife who lives with a different man, here and there, and returns when she please? No! The man is telling the wife- do not think it is my duty to take you back because of the example. Implicit in this is that the wife was trying to pull such a stunt- twisting the example of Lord Rama to say the man still had to act as her husband in spite of the fact that she did not follow the duties of a wife. As King ,Lord Rama had great responsibility to set an example that could not be twisted to support such lopsided values and duties. Any queen shares in this great responsibility, she has greater responsibility than an ordinary woman! After He exiled her,Lord Rama called for Sita to come back, in spite of the societal repercussions. Sita out of love for Lord Rama refused to allow Lord Rama to do this because she felt it would jeopardize His honor. Thus she asked the Earth to swallow her. As the Lords eternal consort Sita was playing the role of an ideal queen. But the act also showed her absolute and pure love for the Lord. This story is so moving and filled with love and honor I think few who read it will mistake the acts of Lord Rama as some distasteful draconian measure toward His most beloved devotee. It is noteworthy that Sita was sent to the forest to be cared for by the great sage Valmiki Muni who she had a desire to visit. Also Valmiki had a woman’s ashram there, as well as a mans ashram! Many people have difficulty understanding why Rama exiled Sita to the forest. In 2003-4 I was looking through the Padma Purana and came across an explanation of this lila. I don’t have Padma Purana with me at this time so what I am now saying is from memory and subject to error in the details, nor can I give you the exact citation. Having said that the Padma purana says that once when she was a young girl Sita and Urmila and other playmates heard some parrots singing songs and chanting mantras about someone called Rama and His adventures. Sita heard her own name being mentioned. She became extremely curious to find out what this was all about. So she and her friends caught the parrots and asked them who this Rama they were singing about was? The parrots said “We don’t don’t know anything, we just sit in the trees near the ashrama of Valmiki muni and all day they are chanting these songs and we as parrots just repeat what we hear.” This didn’t exactly satisfy Sita who said “I am going to put you in a cage and wait and see if this Rama fellow Who you describe actually comes.” The parrots become very agitated at the thought of being caged and protested “we have always lived free in the sky please don’t cage us.” Sita partially relented and grabbed the female parrot and put her in the cage saying “ok I will only put one of you in the cage not both.” The female parrot became highly aggrieved at being separated from her mate and cursed Sita thusly “You have separated me from my mate while I am pregnant. You too will also be separated from your husband when you become pregnant.” Then the female parrot died. The male parrot on seeing his wife caged and then dying swooned and fell down into a pool of water and drowned and was reborn as the dhobi in the city of Ayodhya whose wife was unchaste. Of course Mother Sita doesn’t have to accept a curse especially of a parrot, but just like Citraketu Maharaja and other great personalities have done in the past She accepted it to further a greater plan. Awesome article! I have a few thoughts to add/repeat. The basic idea is that the king must hold the interests of a society, comprised of millions, over his personal interest in his family, comprised of a few individuals. But the dialogues between Lord Rama and other beings of the highest moral character should make it clear that there may be times when the interests of a few trump a utilitarian law or policy. But I believe we only feel the need to make this point because we think people are missing a subtle point which they may or may not be missing. Although Sita would certainly be aggrieved to be separated from her Husband, those with enough intuition will know that Sita’s love of righteousness will make her willing to accept misery for the benefit of society. Moreover, because of Sita’s selfless love for Lord Rama she would willfully accept misery so His honor would not be questioned. This pastime glorifies Sita as much, if not more, than it does Lord Rama. And as mentioned above the bliss of separation is greater than that of being together. This is consistent with the purposes of Krishna’s advent. He comes to uphold righteousness and vanquish evil but His greater purpose is to please and glorify His devotees, of which Sita is the foremost. Puranic stories are there for the less intelligent. When they help becoming spiritually realised it’s wonderful. Otherwise they’re just a waste of time. 1. When Lord Rama got married to Mother Sita He announced in Ayodhya about His “ekapatni vrat”. This caused delight to all the woman(highest to Mother Sita) because it was the usual custom to have many wives at that time and as the nature of woman goes they are not so happy to be a co-wife. Many of the Ayodhya Vasis followed His example including His own brothers. 2. He is the same Lord who became transcendentally mad when Mother Sita was kidnapped. He showed the epitome of madness by inquiring even the stones and trees about Sita Devi. As the popular story goes even Mother Parvati was bewildered by this pastime and came to test Lord Rama. Later He waged a war and destroyed whole Lanka. 3. After Mother Sita was sent to Valmiki Muni ashram once when Lord Rama wanted to perform a particular sacrifice ceremony Vasista Muni said a queen was required for completing the ceremony and suggested Lord Rama to marry. But Lord Rama sticked to His commitment of ‘ekapatni vrat’ and asked sage Vasista for an alternative. Then the sage suggested a golden deity of Mother Sita can be kept. By all this pastimes it is clear that Lord Rama was an ideal husband whom every one can aspire to follow even today. And regarding banishing Sita Devi one point to add to it is Lord Rama sent her to a great sage’s ashram. The sage Valmiki can take care of her nicely and the brahmanical life is more respectable in society than even royal life. Lord Rama appeared to set ideal example of a human being. So at certain times He exemplified certain aspects. The pastime of banishment shows how the King should be ready to forsake His own comforts and attachments for the sake of His praja(people). Thus worshipping fire, with unblinking eyes she chanted and remained there meditating on Rāma. The fire god appeared, shining brightly as if burning everything with his power. Desiring to kill Rāvana, he made an imitation Sītā. He took Sītā, fixed in dharma, and disappeared. Seeing a person similar to Sītā, Rāvana, lord of the demons, took her and went to Lanka situated across the ocean. One should see also Agni Purāna. Though this is not made clear by Vālmiki, his not mentioning it serves to nourish karuna-rasa. The arrangement for explanations sometimes depends on someone else. Comment. This is why. Rama acted as a king to set an example, but Yoga-maya arranged it in a perfect way, as always, accomplishing many purposes in one time; primarily His love; the real Sita had to come back.